Get your web design site off to a flying start with the help of this WordPress theme. It is spiced up with touches of material design, which is the hottest trend of today. Adding more interest and style to the page's look, it keeps harmony with white content sections that bring content to focus. Cherry Framework provides ease of fine-tuning the theme via an intuitive admin panel and embedding content via multiple shortcodes. Its responsive layout will make your projects at everyone's fingertips, from users of smartphones to people surfing the Internet via desktops. 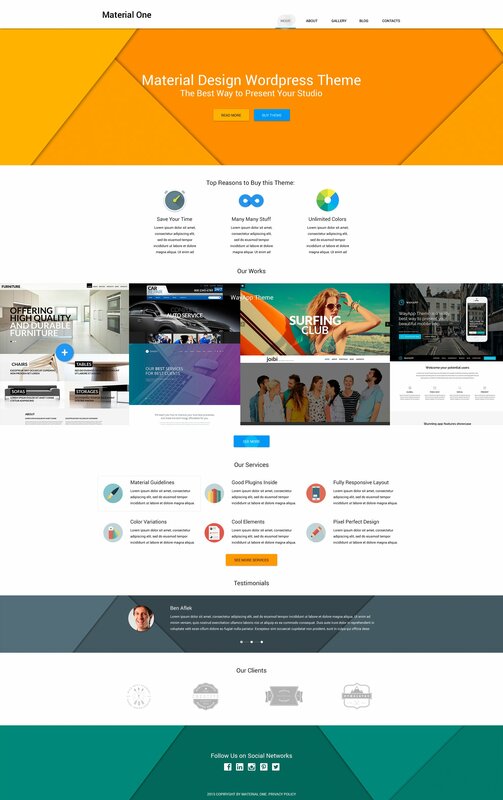 This web design WP theme is also WPML-ready, which will help you translate your site interface and, therefore, bring it to the international scale. Are your Design Shop WP templatescompatible with any CMS? If you purchase the product at a â€˜Buyout price' it guarantees that you are the last person to buy this template from us. It means that this Creative Design Agency WP theme may have been sold before a couple of times (see â€˜Downloads' number in item's properties) but only you and people who bought the template before you will own it. After this kind of purchase the template is being permanently removed from our sales directory and is never available to other customers again. The buyout purchase license allows you to develop the unlimited number of projects based on this template, but the template should be customized differently for every project. I am very satisfied with the services of the company.